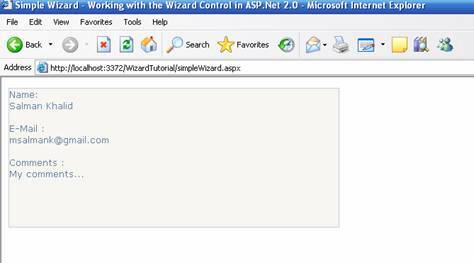 The ASP.NET 2.0 Wizard control simplifies many of the tasks associated with building a web application. 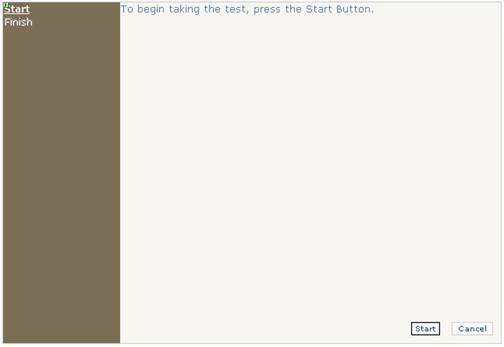 In this tutorial we will look at the basics of the Wizard Control by creating a simple data collection form and then advance to simulate an online test wizard that will be generated dynamically. You can download the sample Wizard project related to this tutorial. 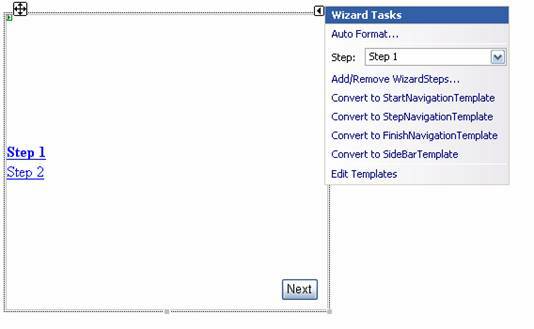 [Top] Create a new page simpleWizard.aspx and switch to design mode. From the Standard group of the Toolbox, drag a Wizard control onto the page. This will create a wizard control with two default steps already in place. Clicking either step allows editing of text and controls displayed in that step. Now letÃ¢â‚¬â„¢s edit both the predefined steps and add a completion step that shows the data submitted by the user in the first two steps. The default format of the wizard makes it hard to identify from where the content area begins. Click on the small box that appears at the upper right corner of the control to open the wizard setting menu. 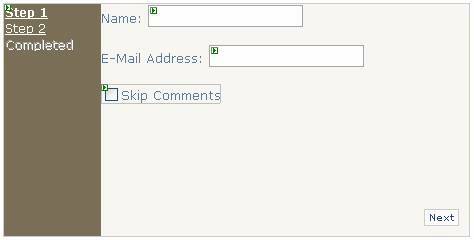 Choose a format that is likeable to you and click OK to apply the format and exit the dialog. 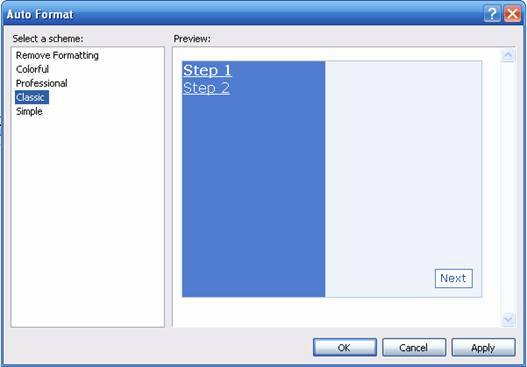 After setting the format, click the underlined Step 1 in the Wizard Control to activate the first step. Click the edit area (the area above the button) to focus on it. You can now edit the display of Step 1. Suppose we want to get the user's name and e-mail address in this step. After clicking in the edit area, type Ã¢â‚¬~Name:'. Then drag a TextBox control onto the active area of the wizard, next to the text you just typed. Press enter, type Ã¢â‚¬~E-Mail Address:' and drag another TextBox onto the active area of the wizard next to the new text. Now we will add a completion step which will display the information the user submitted in the previous two steps. Right-click the wizard control and click Add/Remove Wizard Steps. The WizardStep Collection Editor appears. From the Add drop-down list on the Add button, select Wizard Step. The Properties area now shows the new step. Set the title of the new step to Completed, and its StepType to Complete. Click on OK button to save and exit. Note that the Sidebar in the Completed Step is not visible. This is to prevent navigation to other steps upon arrival to this step. Drag three labels onto the wizard control. Name the labels lblName, lblMail, and lblComments. Save the file. This step will display the data entered by the user in the previous two steps. Using the page's Load event, we can assign the values from the first two steps to the labels in the completion step. Switch to the code, and create a method to handle the NextButtonClick event of the wizard. 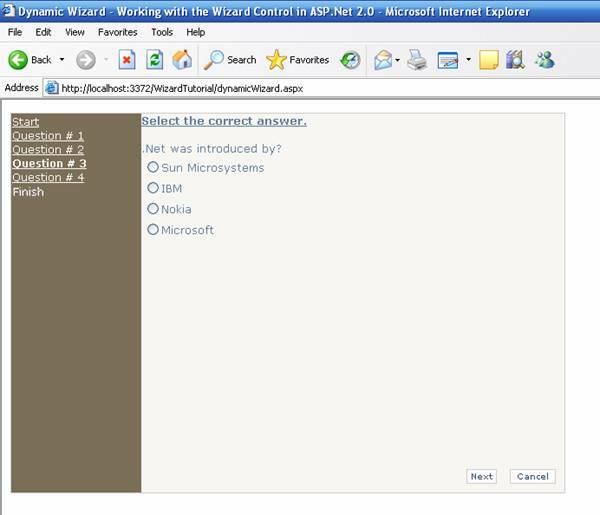 In this section we will create a dynamic online test using the wizard control. The data for the test is being pulled off from an XML file. 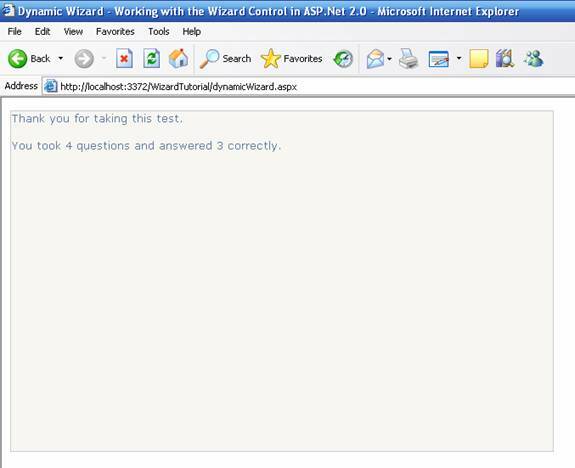 Create a new page, dynamicWizard.aspx and add a Wizard Control to it, myTest. I removed the predefined two steps and added two steps of my own. The first step's StepType property is set to Start and the second step's StepType property is set to Complete. For the completion step, I have added a label, lblResult, to it that will display the result at the end of the test. Now, we create a method to handle the Wizard Init method. Dim question As String = ""
Dim a As String = ""
Dim d As String = ""
'Do not allow return to previous step. lblInstructions.Text = "Select the correct answer." 'Create a line break literal. 'This is required to add a new line or line break. 'Now start adding the controls to the wizard step, one by one. 'Add the step to the Wizard Control. 'this is because we want to insert our steps after the Start Step. After creating and adding the steps to the wizard control, we need to create another method to handle the NextButtonClick event. lblResult.Text = lblResult.Text + " questions and answered " + correctAnswers.ToString() + " correctly." As can be seen in the code, a session has been declared to store scoring. A label or some other control can also be used for this purpose too. 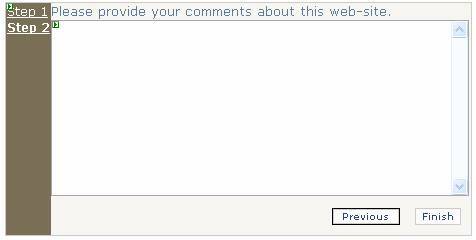 On each answer, the result is updated automatically, displaying to the user the result to his test on completion. Hit CTRL+F5 on your keyboard and run the application. Note : This implementation does not take care of the Browser Back Button. So if the user presses the back button, it will go to the previous page, i.e. going to the previous wizard control. To avoid this you can declare a session variable to record the previous page. If the current page is equal to the previous page index of less than that, it simply means that the Back button was in use, so throw an error. The main emphasis in this article was on ASP.Net 2.0 Wizard Control. There are many options left unturned. Take your time to go through the article code and modify it to experience the Wizard control to its extent. I hope you found this article interesting and informative. I am open for suggestions and remarks, both negative and positive. Feel free to contact me at salman@premierpos.com .